Even though there's no actual touch screen controls in the game, the menu system is touch controlled for easy navigation. "Multiplayer" is right on the main menu. Opening credits are short and download time is very respectable. Everything about the menu system - the labeling, the size of the tappable areas, buffer space, etc. - works well. The controls in Prey The Stars are entirely button-based (unlike the menu system). That's not a bad thing in this case, as touch screen controls may likely have mucked the whole thing up (they wouldn't be natural for this particular type of game). That's not to say everything's perfect, either. In the game, your aim has to be pretty good to get an item into your mouth. If you're not spot on (or close) you'll miss and have to repositions yourself (costing yourself precious seconds and possibly the item in question to an opponent). The game is a closed 3D environment. The graphics are enough to keep everything going, but the look of the graphics is a bit... grainy. For the sound effects alone, the soud is essentially and should be kept on. The ability to hear that something is coming - toward you or toward the playing field in general - is extremely important. There aren't any selectable features in the game, but the gaming experience means you'll actually be playing a sample of the actual main game. If only players could select which of the three available stages will be battled on (same thing with character selections), everything would be even better. From its name, I really didn't know what to expect, but Prey The Stars is an absolute blast to play. Players play simultaneously and can avoid each other or directly interact. Based on an eating mechinic but sometimes without anthing that normally qualifies as "foor" to eat, the game's sense of humor is omnipresent. A lot of creativity and originality went into the game, especially in the multiplayer, and it shows. The game isn't a clone of any other game - it's its own thing. It's got it's own unique flavor, if you will. I'll be playing this one again soon, no doubt! Allow players to select their desired character(s) and stage to play on. Smooth up the graphical like of the game. Allow players to design their own stages using already existing artwork and features from other stages, and allow custom stages to be available in multiplayer. 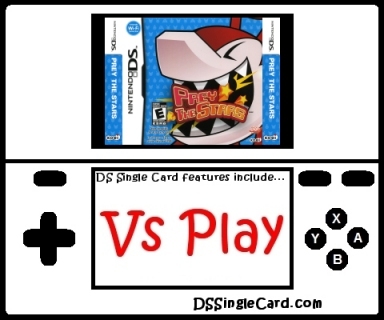 Click here to return to the DSSingleCard.com Prey The Stars profile.